Square Rings and rubber washers can be used in static applications where high sealing load force is required or when the sealing area is too thin to accommodate anything else. 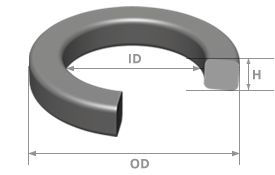 Standard USA size Rubber Square Rings can sometimes be used interchangeably in USA standard size O-Ring gland designs. Consider replacing Rubber Square-Rings with O-Rings or X-Rings that often provide greater performance and greater availability in a variety of materials for the similar or lower cost. Rubber Square Rings are most readily available in general purpose 70 Duro NBR Buna-N USA standard sizes. Most other variations of material, color and durometer are made to order. Custom size Rubber Square Rings and Rubber Washers are typically suppled with NO TOOLING FEE. Square Rings and Rubber Washers can be molded, cut or machined cost effectively depending on the size, material, and quantity.